Newcomer Family Obituaries - Jeanne Ronald 1927 - 2019 - Newcomer Cremations, Funerals & Receptions. 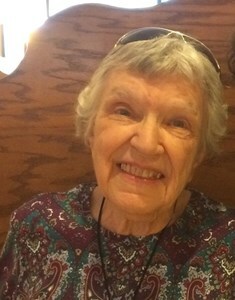 Ronald, Jeanne Hale, age 91, precious Daughter of the King and incredible Mom and Grannie to many, was promoted to Glory on February 2, 2019. She lived her life for others, to the Glory of God, serving with great JOY, and is now reunited with her best friend and husband, Bill, her parents Paul and Edith Hale, and her sister, Janice. Left to miss her terribly, but challenged to be like her, are her children, Gail Clark (husband Mike); Nancy Eckel (husband Greg), Judy Stark (husband Doug), and Rich Ronald (wife Linda). She remains beloved Grannie to grandchildren of whom she was very proud: Carrie (Bobby) Beck, Matt (Missy) Clark, Jason (Angela) Eckel, Chris Eckel, Sean Eckel, Andrew Ronald, Tyler Ronald, and Olivia Ronald. Her seven great grands will miss her hugs and laughter as well: Spencer Beck, Mason Clark, Austynne Eckel, Johnny Eckel, Jameson Eckel, Addyson Eckel, and Alayna Eckel. She was a brilliant woman - doing up to six crossword puzzles a day in ink. She was an avid reader and often shared her current best read to the delight of many. She was a best friend to those ladies in her Monday group, and her Tuesday Morning Glories. She was a woman of great faith, who reflected the grace and encouragement and, above all, JOY for her Lord. She was a member of Oak Hills United Methodist Church for more years than we know, and also had many dear friends at Groesbeck United Methodist Church. She daily read devotionals for Cincinnati Association of the Blind and Visually Impaired and spent years volunteering at Ronald McDonald House. She got her Masters degree in Early Childhood Education in her mid-forties so she could start the Day Care program at OHUMC, which is still going strong today. And she fixed more meals for sick friends, and sent more cards to everyone than anyone we know. We will celebrate her love and life on Thursday, February 7, 2019 at 4:00 pm at Oak Hills United Methodist Church, (at the corner of Bridgetown and Ebenezer Roads). In lieu of flowers, please consider a donation to Oak Hills United Methodist Churuch, 6069 Bridgetown Road, Cincinnati, OH 45248. Add your memories to the guest book of Jeanne Ronald. Judy, I am so sorry for your loss. God bless your memories of your sweet mom. Your mother was always in flight. Out to help someone...., to share a kind word...., always comforting and giving encouragement. Each time I saw her she was always more interested in ME, than what she had accomplished in life. That is a special person. Especially one who gave so much and was so full of life. I know this is a difficult time for each one of you, but allow yourselves to remember what she truly meant to you and savor that with all your might, and for the rest of your lives. Your family has always been special to me, and your Mom a true love. A love that I shall remember forever and that I can see each one of you carrying forward. She would be proud. I only briefly met Mrs. Ronald, and it was a few years ago, but I could immediately tell that she was such a special, joy-filled, welcoming, Godly woman! As one serving alongside her son, Rich, for several years in ministry, I can attest that her legacy lives on well with her children... "Left to miss her terribly, but challenged to be like her..." What a wonderful, honoring, encouraging statement...may we all be more like Mrs. Ronald!